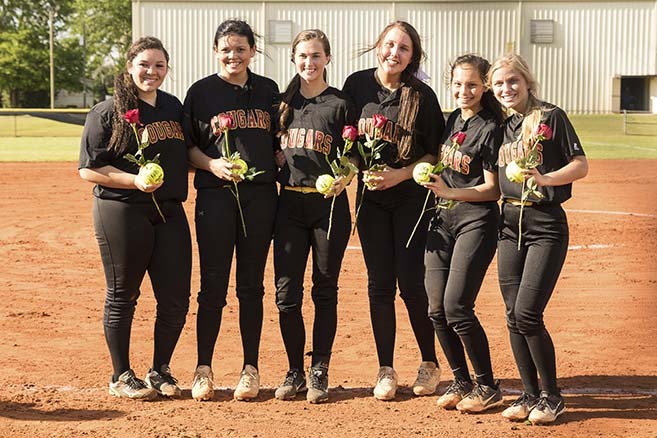 Escambia Academy’s softball team swept a doubleheader from Atmore Christian School on April 8 to clinch its first double-digit win season since 2011. Lexie Hollinger pitched 8 innings over the two games, striking out 9 batters as the Lady Cougars defeated the Lady Rams 12-2 and 13-1. Kiah Parker knocked in three runs during the twin bill; Julie Conway walked twice and drove in two runners, and Mary Thompson Lancaster drove in two runs and stole two bases. Kaile Gumapac and Raven Ramer drove in two runs each. Hollinger took the mound again for the Lady Cougars on April 10, against Clarke Prep. She pitched 5 innings, giving up just 4 earned runs as EA fell 10-0 to the Lady Gators. Despite the dominating performance over Atmore Christian just days earlier, the EA girls couldn’t repeat the process and had trouble finding a rhythm in the field and at the plate against Clarke. Conway and Parker tried to open up a light at the end of the tunnel for the Cougars with a single each, but no run production came from the base hits.